CF Logistics Services continually adds more LTL destinations to better serve you. We offer service to most areas at least 3 days per week. 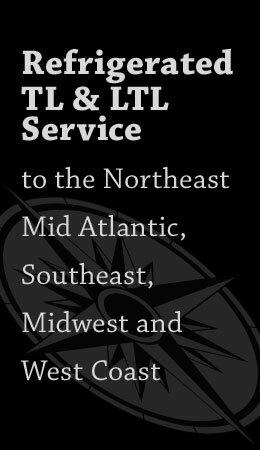 Our 25 trucks and 30 contract carriers provide Refrigerated TL & LTL Service to the Northeast, Mid Atlantic, Southeast, and Midwest. We have also begun limited service to the West Coast. Because we go to the same destinations, multiple times per week we have the ability to get your product to your customers when they need it. We service 22 states overnight and the balance in two days. Our fleet is equipped with either GPS Systems or cell phones so that we can update your deliveries. We have dedicated drivers on most of our routes so that your receivers can be assured of on time deliveries. Cross docking and warehousing services are also available at our Avondale, PA and Winter Haven, FL facilities. This allows you to bring in larger quantities of product and have it distributed to you when you need it for just in time deliveries.